one of these days, that will be cool. The seminarians would often preach in the country churches surrounding Jackson; at times, the drive would be 90 minutes or more to the little congregations out in the boonies. My friend, a Floridian, often wore flip-flops. 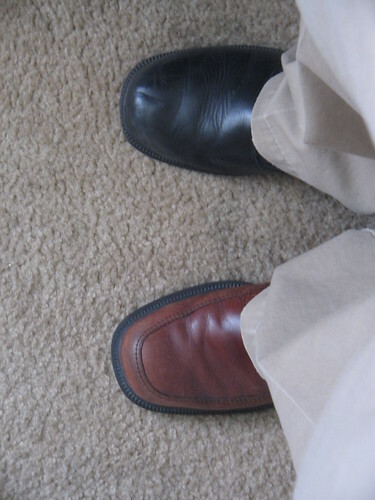 Dress shoes were worn by him once or twice a week in the warmer months. As it happened, the lawn by the entrance to his house was torn-up due to sewer work. This included the concrete walk to the front steps. A few boards laid across the muddy lawn were the only passage into the portion of the house he was living in. On Saturday nights, he would polish his dress shoes and put them in the car. He’d wear flip flops until he got to the church, and then before getting out, would slip on socks and the shoes. One Saturday night, he polished his shoes, and was intending to put them in the car. He got a phone call which distracted him, and he had to leave the house to tend to some matter of business. He forgot to put the shoes in the car that night. The place where he had polished the shoes wasn’t in a main traffic-way in the house, so he didn’t notice that he had forgotten to put them in the car. Sunday morning, he got up early and shoved-off around 7:30 AM for a 9:15 AM Sunday School in south Mississippi. Three-piece suit. Flip-flops. Yellow flip flops. Think shower thongs. He arrived about 9:05 AM at the church, looked in the space behind the driver’s seat for his dress shoes, and, nada. He sheepishly explained his situation to the elders then present; it was too late to head back to Jackson and get his shoes. He preached that day in flip-flops. He barely moved from behind the pulpit. it always happen to me.